Tomatoes can be affected by fungal diseases., Alternaria rots of tomatoes appear as dark brown to black, smooth, and slightly sunken lesions; Alt. alternata attacks tomato damaged by mechanical injury, cracking due to excessive moisture during growth, or chilling; Cladosporium rot caused by Cladosporium herbarum and grey mould rot due to Bot. cinerea can both be potentiated by chilling injury. Rot can spread rapidly at higher temperatures, during packing and transport. Rhizopus rot, Sour rot is caused by Geo. candidum, Soil rot caused by Rhizoctonia solani, Alternaria alternata is a causal agent of blackmold rot of tomato. 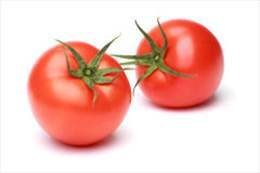 Chitoly™ AF or Antimix™ CN could act as an attractive preservative agent for postharvest tomatoes owing to its antifungal activity and its ability to stimulate some defense responses during storage.